This packet includes 16 work pages for students to complete during reading workstations or for morning work. 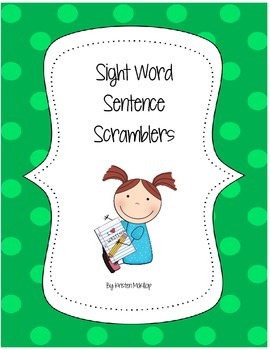 Each page includes sight words that are generally the harder words for Kindergarten, First and Second graders. See the thumbnail for all of the words included in the 16 pages. 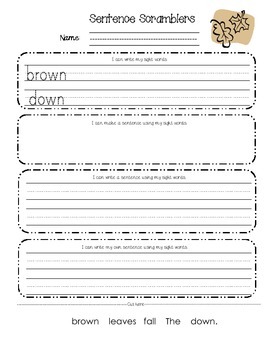 On each page students are required to write their sight words, cut and paste a scrambled sentence in order, rewrite the corrected sentence and write their own new sentence using the same two sight words. 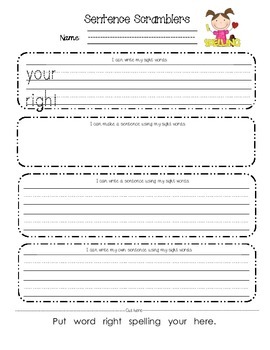 I also have my students turn the paper over and draw a picture of the sentence if they have time, or if they have trouble creating their own sentence. 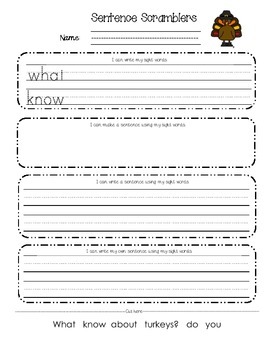 This is an independent activity where students will practice reading their sight words and writing complete sentences with capitals and punctuation marks.